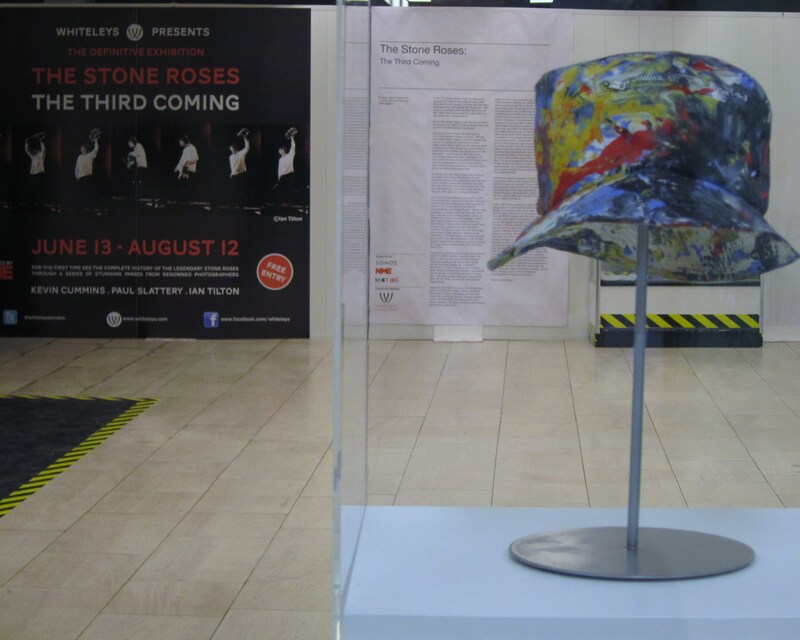 A Stone Roses photo exhibition is currently showing at Whiteley’s in London. About the time I was throwing myself around in a moshpit to the delicate sounds of Metallica, all the cool kids were silently ditching their Style Council records, cardigans and black polo-neck jumpers and were searching for some new sounds and threads to wear. Led by chief howler monkey Ian Brown, one of the most charismatic rock stars ever to eat bananas with his feet, and featuring guitarist / ex-Dangermouse cartoonist John Squire, bass-playing future Primal Screamer Mani, and bonnet-sporting drummer Reni, the band called themselves The Stone Roses. They changed the world* by tripping over their 28 inch bell-bottomed flares and floppy haircuts; none of which would raise an eyebrow now, but in 1989 let me tell you that was pretty revolutionary. Until then the tyranny of drainpipe trousers was pretty solid. What had punk been about if not to banish flares and all the hippy psychedelic rubbish that accompanied them? Ten minute songs were not for punks. They were immediately styled a ‘60s sounding band by the media due to the Byrds-esque jangle of Squire’s guitar (although no sixties band played those beats: James Brown and Tomorrow Never Knows excepted). This was a time when having a sixties sound wasn’t really where music was heading. Music was heading towards a Stock Aitken and Waterman led cul-de-sac. Indie was for Goths and for people who looked gloomy and liked The Cure. The Stone Roses and their ilk invited everyone to the indie disco. The band made a huge impact in the UK and produced some great songs before they succumbed to the usual squabbling with each other and particularly their record company before splitting up in 1996 after just two albums. You’ll have been doing pretty well not to have noticed that The Stone Roses have reformed after a 15 year absence. Between the 29th June and 1st July they will play to a combined 150,000 people at Heaton Park in Manchester. However, like the reformed Van Halen and Aerosmith, internally all may not be a bowl of cherries. 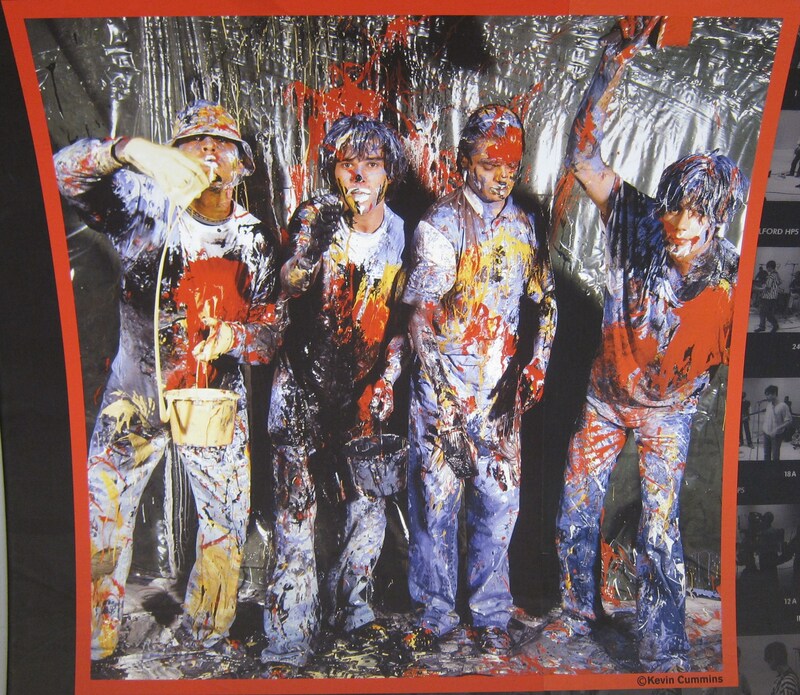 Three photographers covered The Stone Roses’ rise perhaps more memorably than others, and the three have come together to display their most iconic images in one place. They are Kevin Cummins (NME paint cover), Ian Tilton (Spike Island images) and Paul Slattery (early portraits for the debut album). They headed to Whiteleys in Bayswater, London to launch the exhibition a couple of weeks ago in an optimistic attempt to “recreate the atmosphere of the Hacienda” as the invite put it. That was never going to happen. Nevertheless, the exhibition is excellent, admission is free, and all images are for sale in limited numbered signed editions. 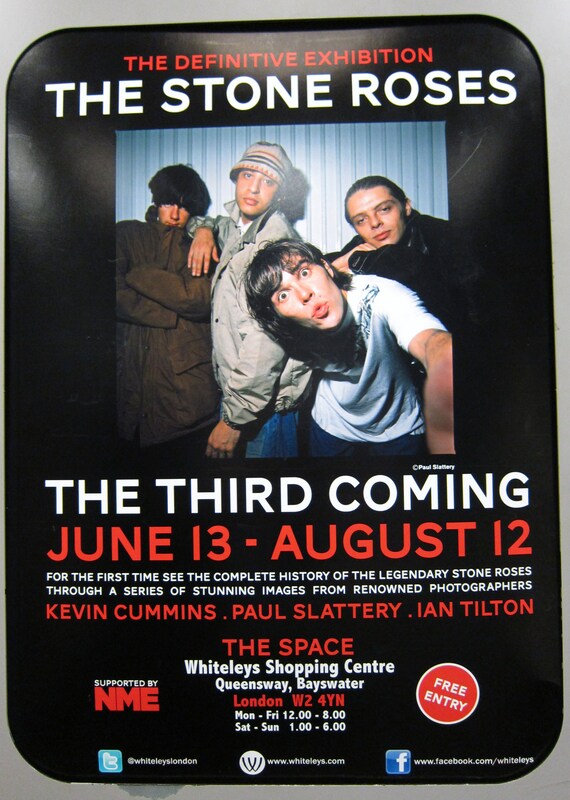 The Stone Roses: The Third Coming is at The Space in Whiteleys, Bayswater, London until August 12 2012.The Stone Roses are touring Europe, play Heaton Park, Manchester 29th June – 1st July and headline the V Festival 2012, on 17th and 18th August in Chelmsford and Staffordshire. I enjoyed reading this. I missed out on The astone Roses thing first time round – thought I was too old and that was reinforced by my kid brother being into them big time! However saw king monkey Ian Brown at a festival a couple of years ago – couldn’t sing but it didn’t matter – he and the gig were fantastic! Now I’m hooked! Though I wonder how lOng the reunion is going to last!! !